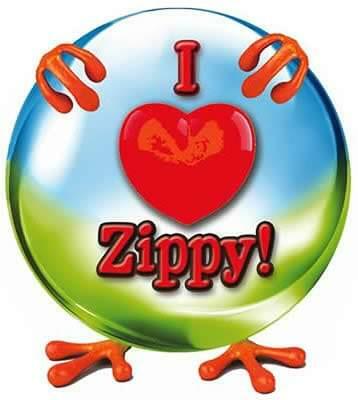 Stickers for all of Zippy's biggest (and smallest) fans! The colorful illustration shows our hero Zippy holding up a big, 3-D, watery-looking globe in nice shades of blue and green, and on that is the 3-D saying, in bright red, proclaiming love for everyone's favorite singing (?) toad. We think kids will enjoy it on their music folder, book bag, tote bag, ball cap, backpack, or in their room at home.